The legalization of marijuana is spreading like a bushfire across the U.S. and in many countries all over the globe. Many people are now allowed to grow their own supplies of cannabis. The process of growing marijuana may seem complicated, but this is mainly attributed to the fact that you probably weren't given proper information. Many people tend to unintentionally make growing cannabis seem a harder task than it actually is. 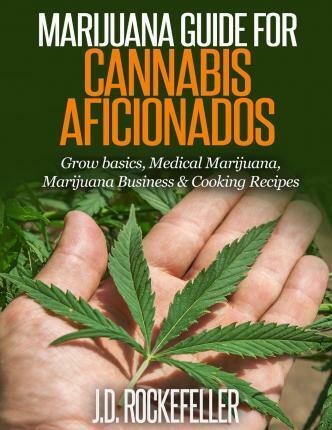 This guide for the cannabis aficionado has a wealth of information and in it you will learn: My Gift to You! Table of Contents PART I - MARIJUANA GROW BASICS Introduction Choosing Your Grow Light: Determining the Kind of Light You'll Need to Successfully Grow Marijuana Choosing Your Growing Medium Growing Outdoors Marijuana Indoor Growing Harvesting and Drying Marijuana Conclusion PART II - MEDICAL MARIJUANA Introduction Marijuana as Medicine Medical Uses of Marijuana Using Medical Marijuana So, How Does Cannabis Work? Strains of Medical Marijuana Medical Uses of Marijuana Conclusion PART III - MARIJUANA BUSINESS: How to successfully open and run a marijuana dispensary grow facility Introduction How to Open a Medical Marijuana Dispensary: A Bit of Background A Look at How Marijuana Dispensaries Work Challenges of a Marijuana Medical Dispensary What to Do When Opening a Medical Marijuana Dispensary The Kind of Costs and Revenues to Expect From A Medical Marijuana Dispensary What Are the Auxiliary Benefits of Starting a Medical Marijuana Dispensary? Other Important Considerations to Make Before Starting And Running A Medical Marijuana Dispensary Conclusion PART IV - COOKING WITH MARIJUANA - CANNABIS FOODS AND RECIPES Introduction How to Decarboxylate Your Marijuana How to Make Canna Butter How to Make Canna Ghee or Clarified Marijuana Butter How to Make Canna Oil How to Make Canna Flour How to Make Canna Paste How to make canna milk Sweet Potato Soup with Canna Oil Green Leafy Kale Salad with Cannabutter Dressing Cucumber, Avocado and Basil Dip with Marijuana Canna Chocolate Pudding Marijuana Brownie Chocolate Space Cake Marijuana besan laddoo A Sweet Drink Made with Cannabis Paste Canna Tea Take advantage of this great opportunity and take your knowledge and enjoyment of cannabis to the next level!